The Rourkes are coming soon! The Rourkes series will be here May 14–Royal Catch, Royal Hottie, and Royal Darling! These steamy royal romcoms feature a family of swoon-worthy princes and kickass princesses. 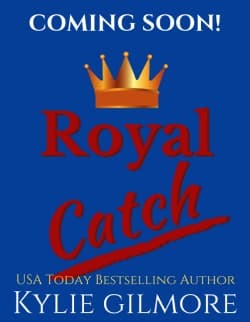 All the details will be in my newsletter and stay tuned for the cover reveal of book 1, Royal Catch. I am the crown prince of Villroy, heir to a kingdom, bound by duty to marry and produce an heir. I expected a quiet arrangement through royal channels, instead I got a palace full of women vying for my hand. And how do they “win” this barbaric game set up by my crafty mother? By figuring out how to save the kingdom’s faltering economy through a series of challenges. This undignified circus is beneath a man of my stature! Proof being that a saucy, ill-mannered woman wearing body-hugging clothes is in the lead. I could never love someone like that, let alone marry her. I pose as my friend, pick up her inheritance, and return with the cash to keep her out of jail. (Apparently, being a princess in hiding is no excuse for identity theft.) So, yeah, I’m not exactly royal. I’m an orphan, a self-made woman, and proud of it. Suddenly I’m in a battle royale with a bunch of crazy competitive women for “riches beyond our dreams.” I’m in a time crunch, which means I need to win this competition fast. Only, that means winning over the judge; the smoldering hot grim-faced Gabriel. And now I find myself wanting to compete for more than just the money. But could a royal prince ever fall for a commoner like me?